Robert Shaw slaughters his wife's lover and runs away with his secretary Jacqueline. Helped by a French trapper who takes them for film-makers, they hide in Northern Canada. On a small island in the middle of the river where Tramontana almost always blows, some losers tear each other to pieces . The months before World War II. The fear of the impending war never leaves the guests of an hotel in Paris. The original title was "La Loi du Nord" (the law of the north) but became,during the German Occupation " La Piste du Nord"(the trail of the north) :the corporal Dal represented the law ,but (and he told it so to his pals) the law of the British Crown and the German censorship was not prepared to accept it . 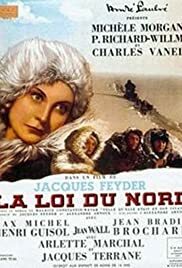 That said "La Loi du Nord" is not really a successful movie.Jacques Feyder's best films were by now behind him;one can say that he peaked with "la Kermesse Heroïque " which would remain his greatest achievement . "Les Gens du Voyage" had some coherence but "la Loi du Nord" suffered from an average-to-good screenplay,and the characters' motives are not clearly defined :the love for a gorgeous woman (Morgan)? But objections remain:it is impossible to believe that ,in the first part,Morgan is deeply in love with her boss .And why does Louis help the fugitives when he learns they are wanted ?Why does Dal forget his duty?We have to take for granted that Morgan's beauty explains everything.Although handicapped by one of the worst beginnings ever filmed: bad melodramatic scenes,the one in the insane asylum takes the biscuit! Things get better when Feyder begins to film on location in the splendid landscapes of Laponia.But then again ,Pierre Richard Wilm 's wooden acting and Jacques Terrane's clumsy performance get in the way.Michèle Morgan and Charles Vanel easily outclass them.Vanel gives a warm performance and the scene in his house where Jacqueline discovers all his little secrets is probably more convincing than the rest,probably because the two others are not present.